Remembering how spring hurried in and rushed past so quickly last year has made the this year’s leisurely drift into spring all the more enjoyable. The garden’s gentle pace toward April flowering has been a gift, allowing time to watch and anticipate. Standing in the garden yesterday, I had that feeling for the first time this year that the individual plants were coalescing, uniting to form a whole, unifying to create a balance to the garden that escapes it other times of the year. 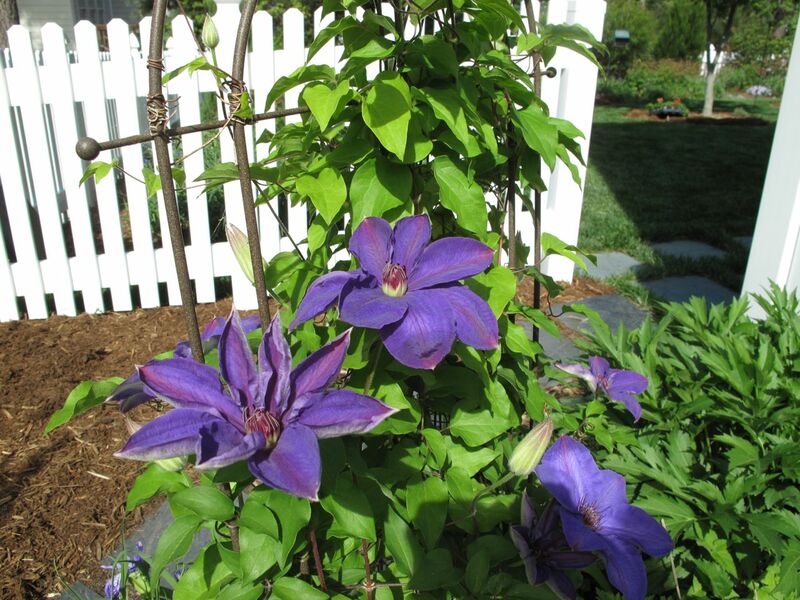 This early part of the gardening season, with its fresh growth of foliage, tender young shoots and the promise of imminent flowering is my favorite time in the garden. 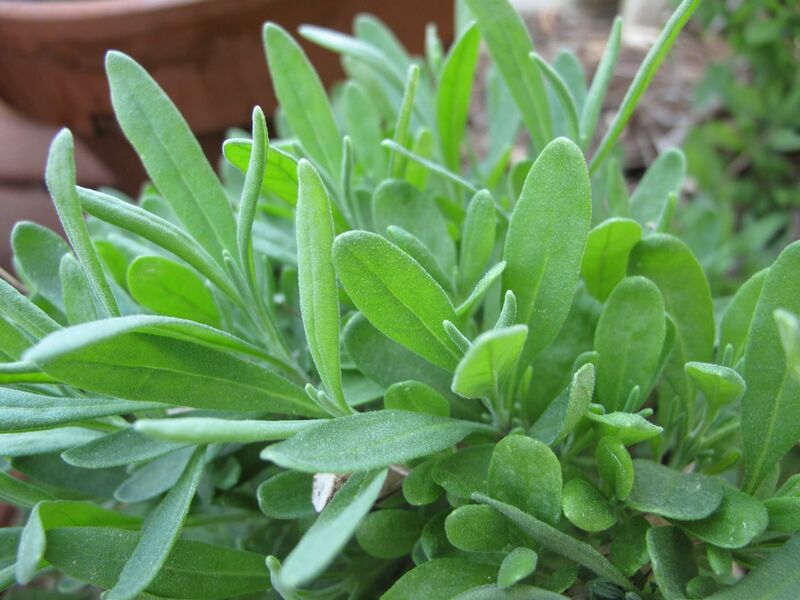 Lavandula x intermedia ‘Dutch’ (Dutch Lavender) shows a fresh flush of leaves after being cut back severely in late winter. 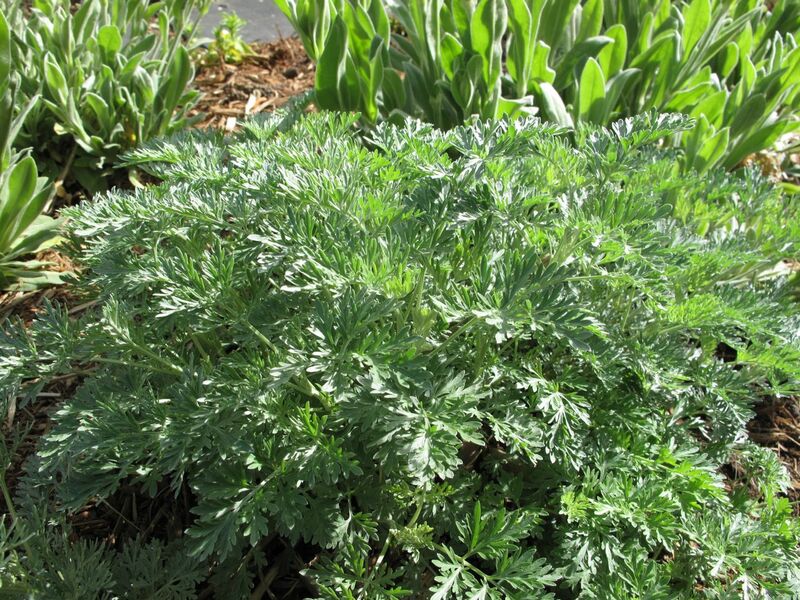 New leaves of Artemisia ‘Powis Castle’ (Wormwood) are fresh and healthy after a hard pruning. This sits in front of white-blooming Lychnis coronaria (Rose Campion). 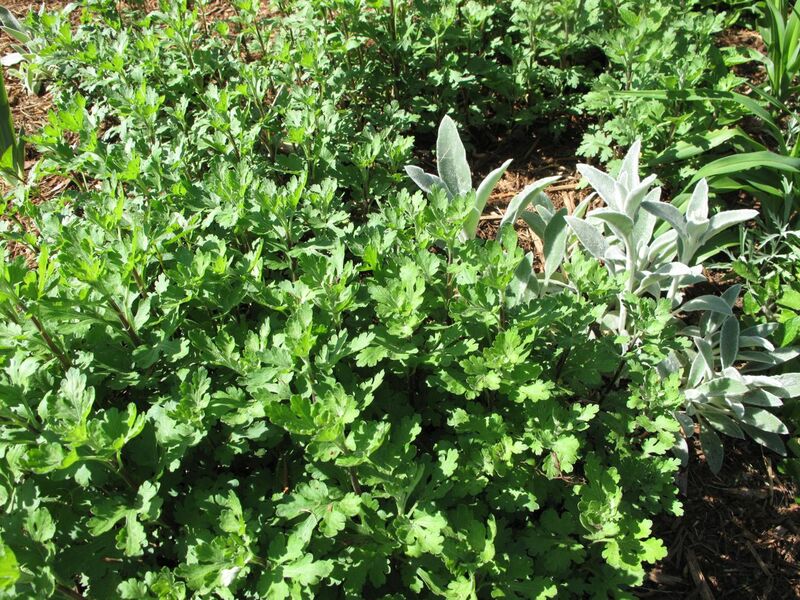 The early spring foliage of this Chrysanthemum complements the silvery, fuzzy leaves of Stachys byzantina (Lamb’s Ear). Both of these are some old-fashioned pass-along plants. 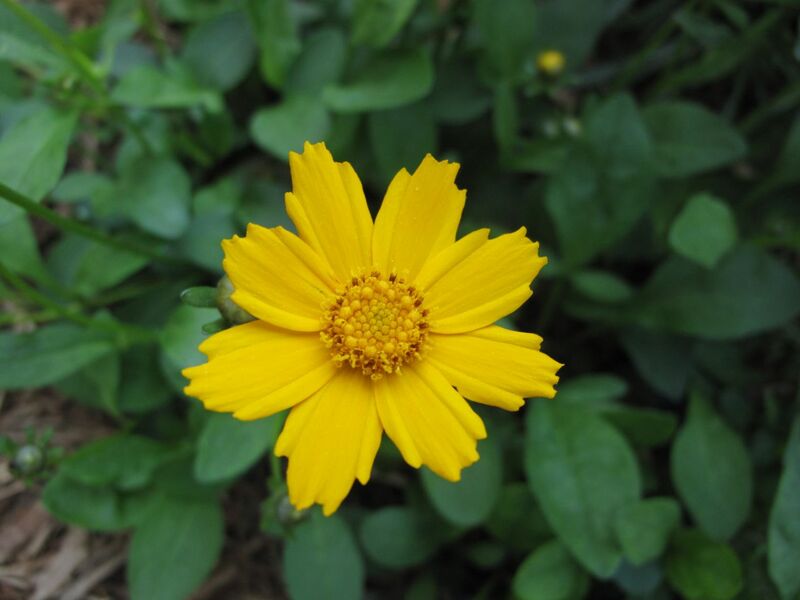 The first Coreopsis blooms are open and colored a deep sunny yellow. 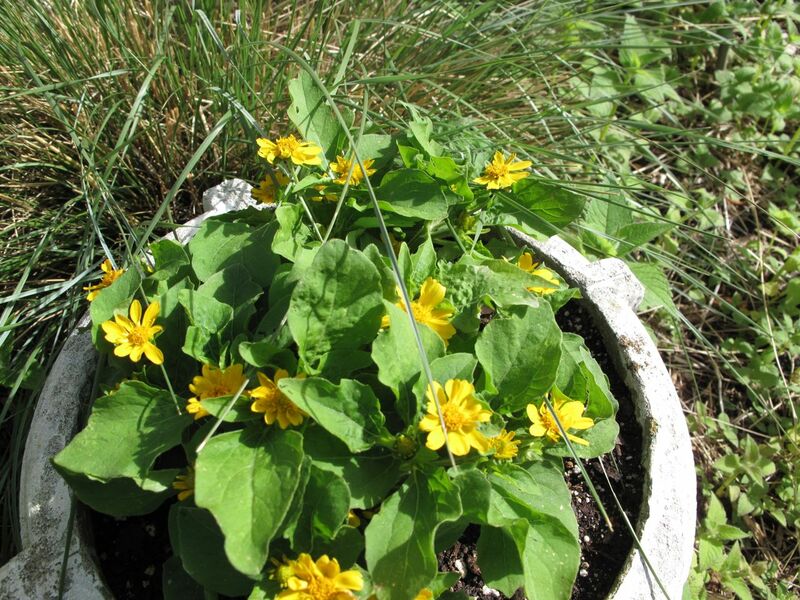 Chrysogonum virginianum (Green and Gold) is a native that I have tried several times to establish as a groundcover in this garden. This one was added last spring and looks promising. 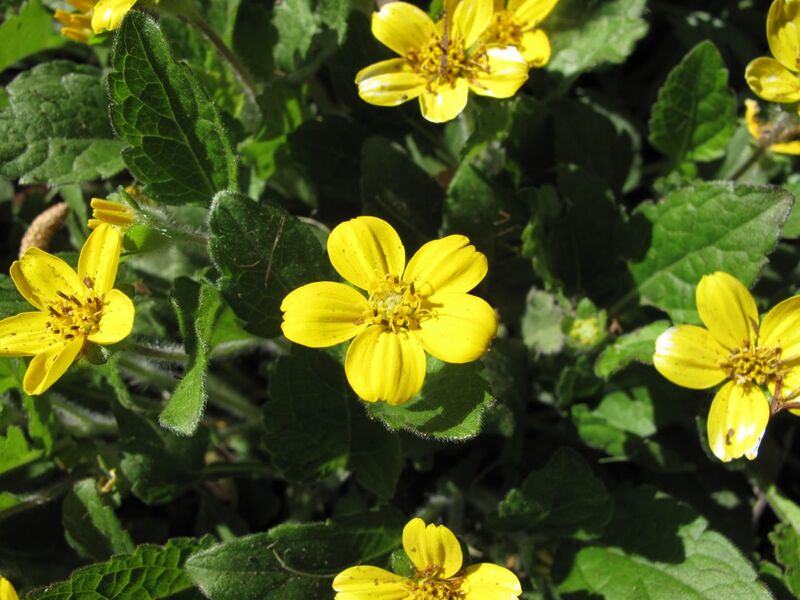 Today I noticed it being used in a garden along with Coreopsis and it worked well. Melampodium ‘Showstar’ is a reliable summer-blooming annual that tolerates the heat and drought. 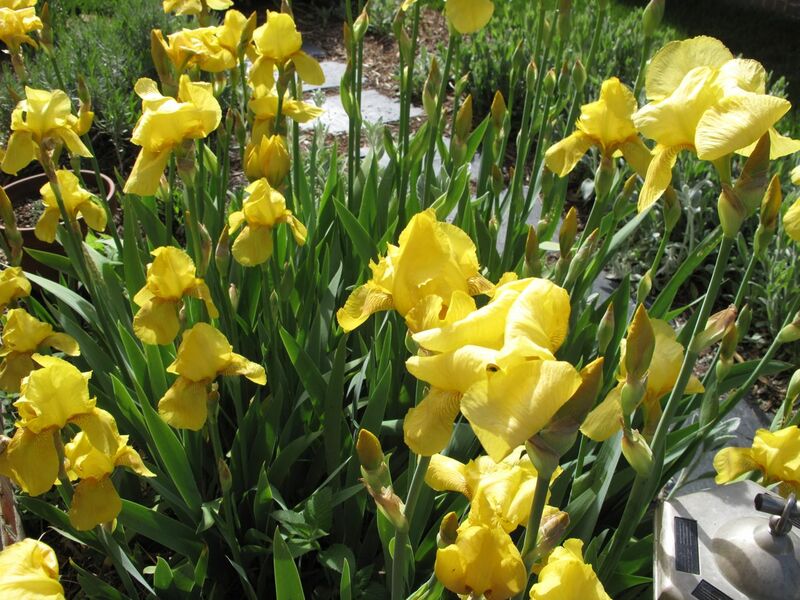 The first tall irises to open each year are making a strong show this year, filling up the Southern side path. A long-time favorite pass-along, this year Tradescantia (Spiderwort) is on probation in the garden. Last fall and late winter I dug out untold numbers of strays and yet many more are showing up in odd places. At this time of year it is lovely though. 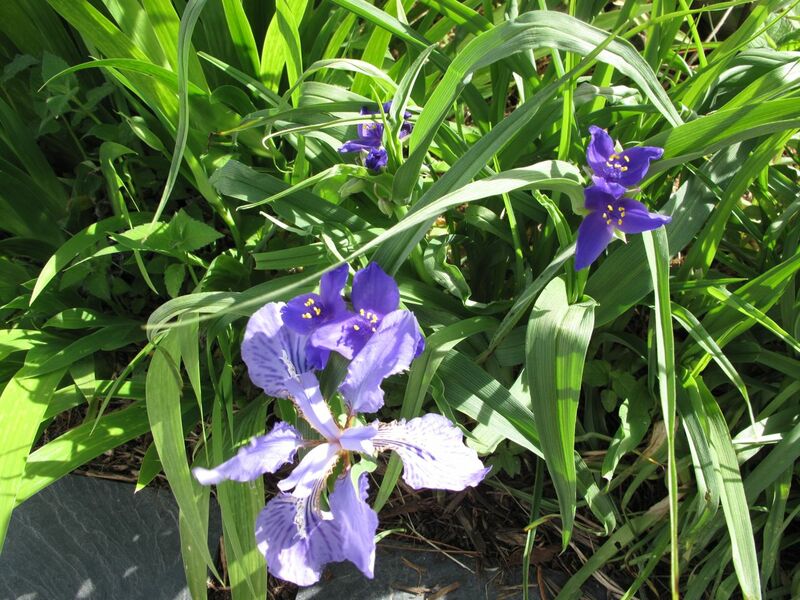 Here it mingles angelically with an Iris without a name, also passed along by a friend. 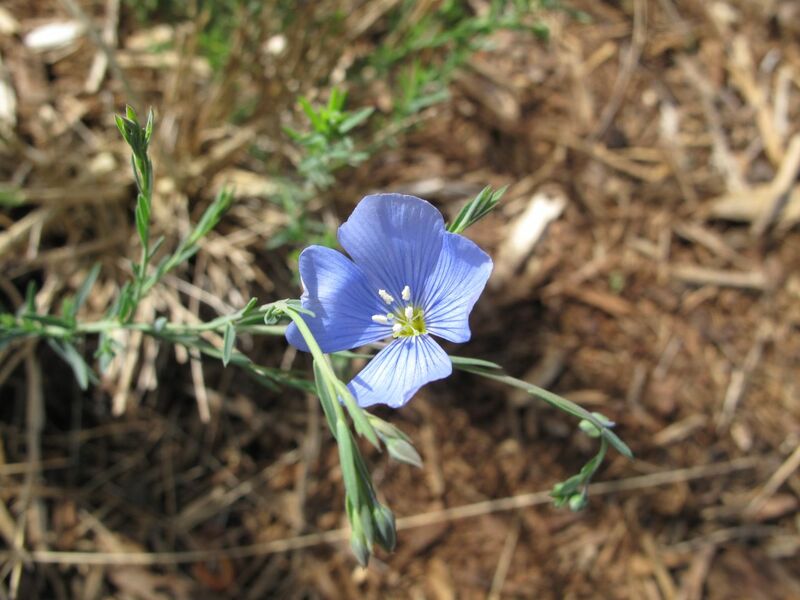 Linum Perenne ‘Sapphire’ (Flax) does not perform very well in this garden but the perfect blue color of its dainty flower keeps me trying. 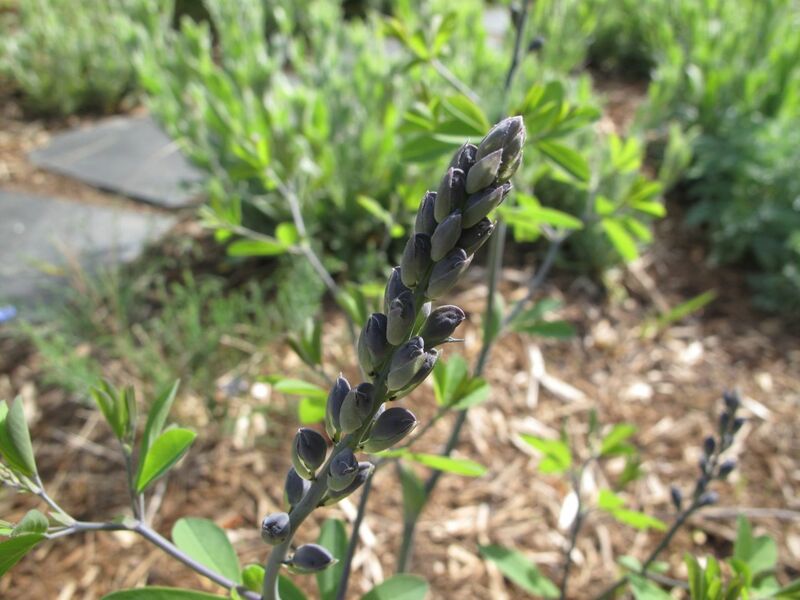 Baptisia ‘Purple Smoke’ was blooming by this time last year. There are two other Baptisias in the garden. Ants have found the Paeonia ‘Pink Parfait’ and presumably are enjoying the nectar. 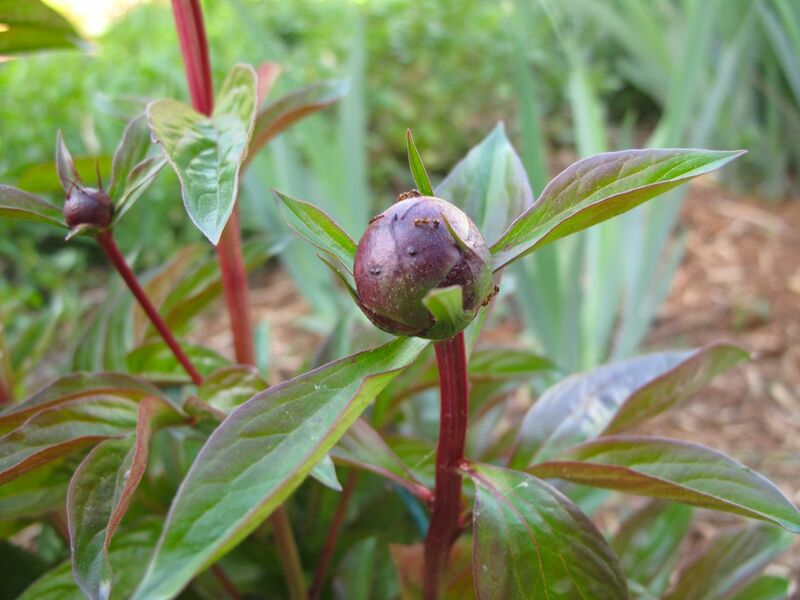 Looking back I see this Peony is at the same stage as it was this time last year. 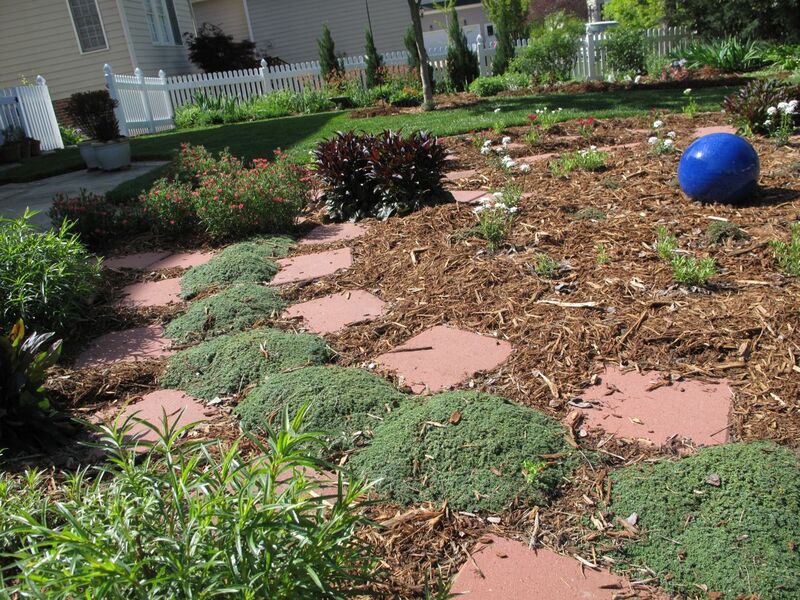 Overall the garden has filled in quite a lot in just a few weeks and the Meditation Circle plantings are growing well. 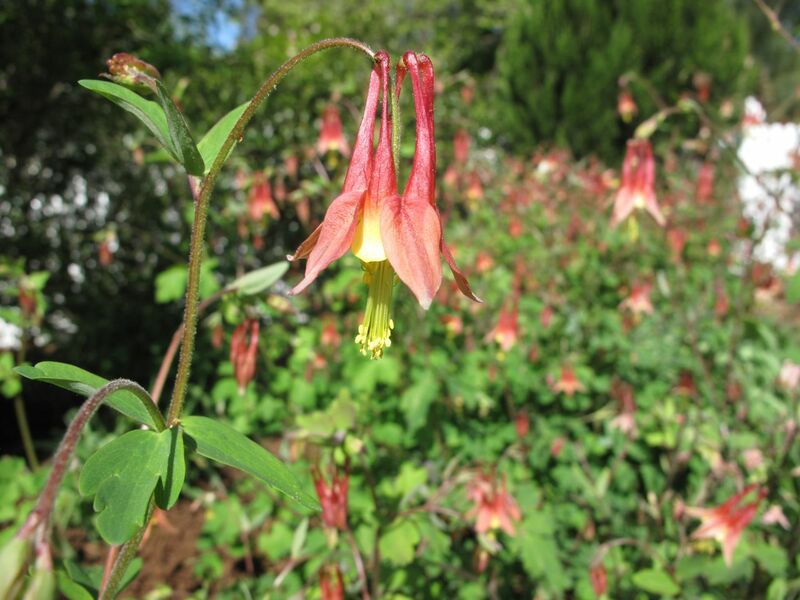 Aquilegia canadensis (Eastern red columbine) is everywhere. Iris ger. ‘Raspberry Blush’ is getting lovelier every day. This entry was posted in garden and tagged early spring plants, meditation circle, Spring Flowers, spring garden on April 26, 2013 by pbmgarden. Thanks so much Cathy! Irises are my favorite flower (at least this time of year). Glad you like the Green and Gold. Enjoy your gardening this weekend. 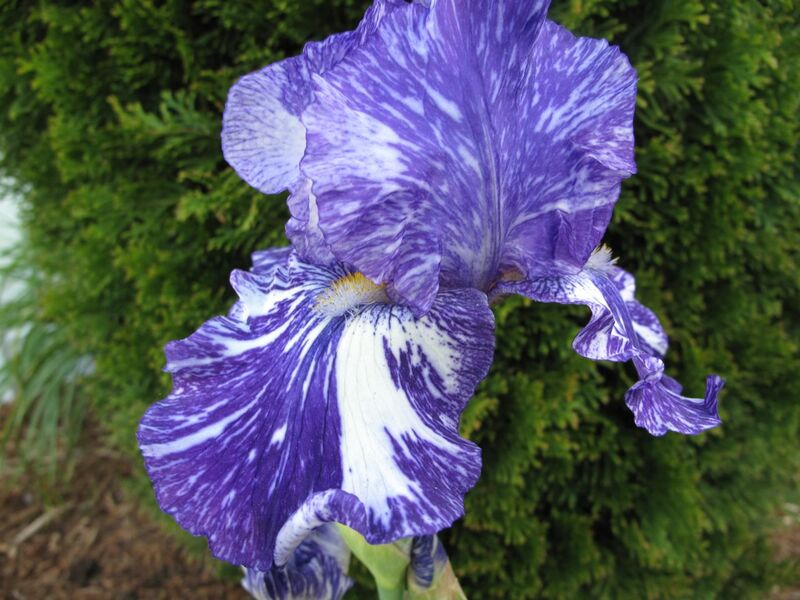 Your irises are stunning, especially “Batik”. You are quite a way ahead of us but all the new growth is saying that spring has arrived at last! Thanks Pauline! That ‘Batik’ is unusual isn’t it? Never spreads much like the others though. Yes, spring is finally here, but even now is slow. We’re anticipating cooler than usual temperatures all week. 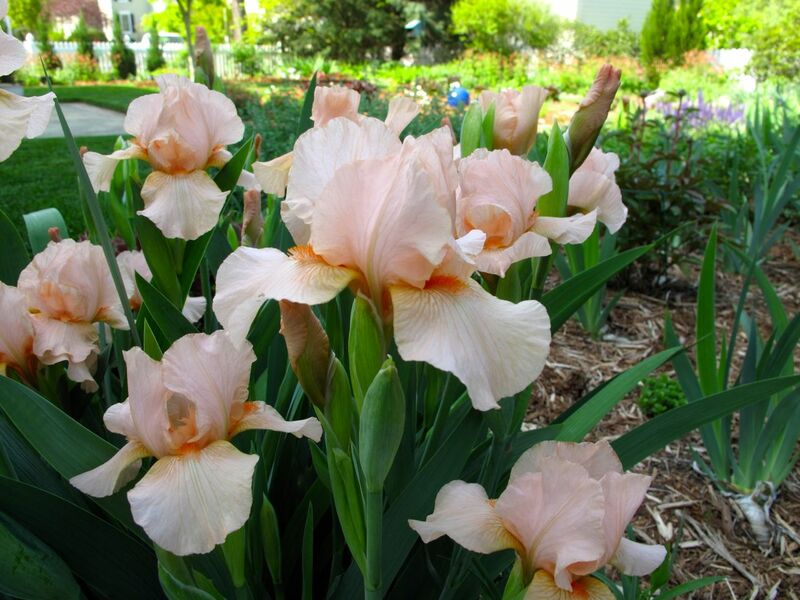 Fabulous growth and such beautiful blooms…I love that pinky colored iris. Thanks Donna! The garden is finally showing signs of spring. The color of that ‘Raspberry Blush’ is paler than I had expected given the name, but I agree it is nice. There’s quite a bit of color going on there. Love the iris! The garden is becoming colorful indeed with other irises soon to open. Nice time of year. Thank you PJ. 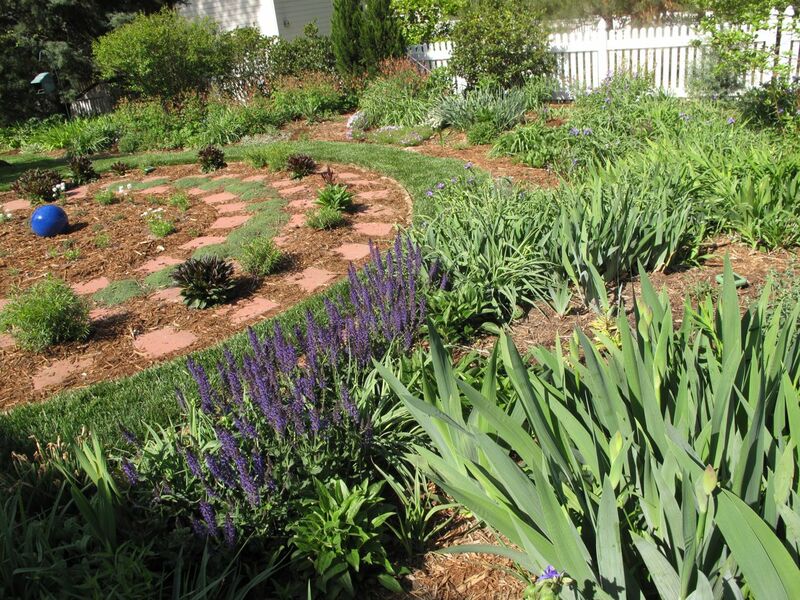 This time of year is nice–things don’t need deadheading and the like, although there is a lot to do. I spent the day in the garden doing a variety of chores and really could appreciate the irises. Thanks you Malc. It’s always exciting to see things jump back to life.